Southampton (United Kingdom) (AFP) – Jurgen Klopp backed Mohamed Salah and Roberto Firmino’s cases for player of the year honours after they each bagged a goal and an assist to ensure an easy 2-0 win for Liverpool at Southampton. Salah teed up Firmino to open the scoring with his 20th goal of the season after just six minutes, before the Brazilian returned the favour with a stunning backheeled pass for Salah to slot home just before half-time. Harry Kane and Sergio Aguero furthered their cases to win the golden boot by downing Arsenal and Leicester respectively on Saturday. But Salah is now just one behind Kane and has one more than the Argentine with 22 Premier League goals in a prolific first season at Anfield. “I really think Aguero and Kane and a few others are realy good players as well, but our boys are important for us,” said Klopp. “I love their skills and attitude, but their work rate is outstanding. Much of the attention before kick-off at St Mary’s was focused on Virgil van Dijk’s return just weeks after he became the world’s most expensive defender by becoming Liverpool’s latest signing from Southampton in a £75 million move. However, the Dutchman couldn’t have wished for a more straightfoward 90 minutes as he shrugged off the boos of the home fans to record a first clean sheet and Premier League win in a Liverpool shirt. “He did really well,” added Klopp. “He coped with the situation fantastic. We had a little talk before the game but I didn’t want to make him nervous if he isn’t nervous (and) obviously he wasn’t. Victory saw Liverpool leapfrog Tottenham back into third and close to within two points of Manchester United in second after Jose Mourinho’s men were shocked 1-0 at Newcastle earlier on Sunday. However, victory for Chelsea over West Brom on Monday would see second and fifth separated by just four points in the fight for the top four. And with the battle to avoid the drop still including up to 10 teams, Klopp believes their desperation could influence the top end of the table. “It will stay pretty tight until the end of the season I’m pretty sure,” added the German. 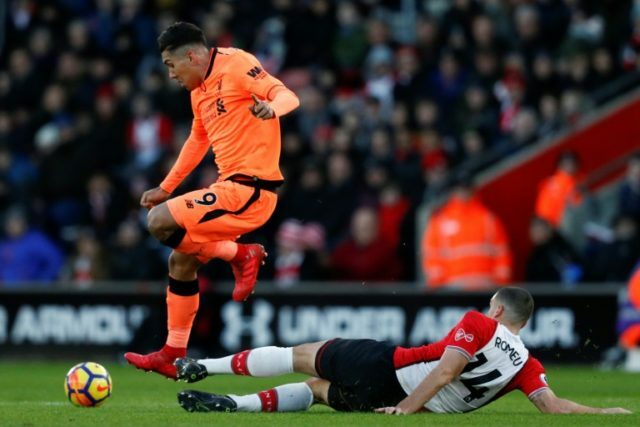 Southampton’s toothless second-half display saw the home crowd turn their ire from Van Dijk to manager Mauricio Pellegrino. Chants of ‘you don’t know what you’re doing’ greeted the Argentine’s substitutions and he criticised his side’s lack of belief in the second period. “We had to be more brave in these situations,” said Pellegrino. “Sometimes you can be losing 2-0, but you have to show another spirit to try and bounce back, and at least to try until the end. Without a home win since November, Pellegrino admitted it is hard to complain about the reaction of the fans after Southampton slipped into the relegation zone.